Gram had a trick, one that I have never forgotten and have always used since. Once the potatoes are cooked and cut, instead of using vinegar, she would toss the potatoes in Italian dressing. You get your vinegar in there, along with a bunch of built-in seasonings. It’s a genius idea that I absolutely love. 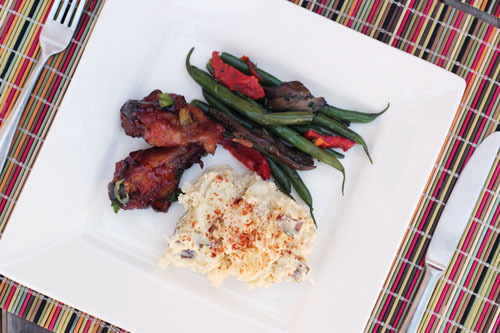 Since I needed to also add a “twist” to my potato salad recipe, I decided to go for a healthy twist. In fact, I went for three healthy twists on this classic! Replace the bulk of the mayonnaise with fat-free yogurt…less fat and the health benefits of yogurt to boot! Leave the skins on the potatoes…that’s where are all the vitamins are! 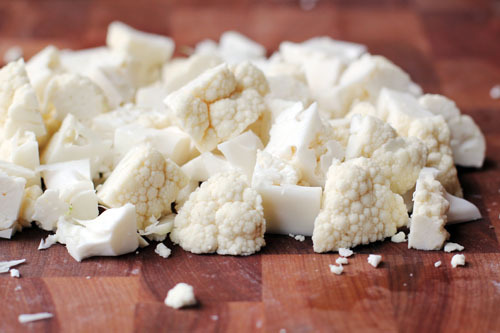 Throw in some cauliflower…easily hidden, most people won’t even know it’s there (Nate didn’t notice after eating a whole serving) and this nutrient-packed veggie adds an additional healthy kick to the salad. And guess what? 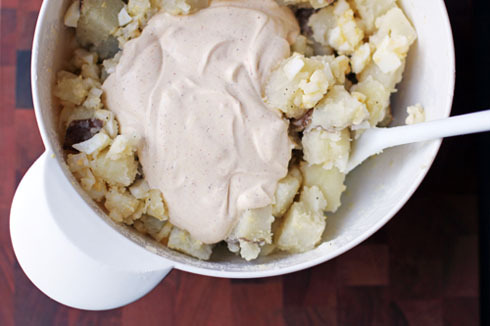 This healthier version of the classic potato salad tastes just like…potato salad! Go figure. Seriously, it tasted just like the much less-healthy version I used to make. These twists are here to stay! 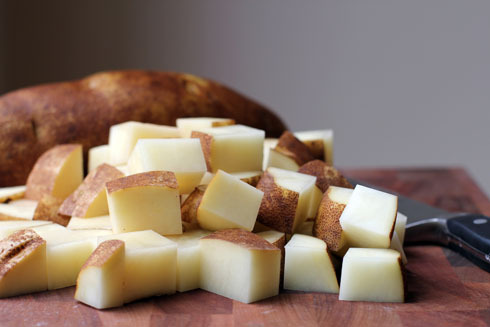 Chop unpeeled potatoes into 1”³ cubes. Add to a pot and cover with cold water. Bring to a boil over high heat. Once boiling, reduce heat to medium and lightly boil 5-10 more minutes, until potatoes are easily pierced by a fork but not falling apart. Drain potatoes and put in refrigerator until cool. Feel free to fish out potato peels that have fallen off any potato pieces”¦some of them may do that after cooking. Mix together the potatoes, eggs, cauliflower and onion. Pour Italian dressing over the mixture and toss to cover. Mix together mayonnaise, yogurt, mustard, dry mustard, salt, pepper and paprika. Add to potato mixture and stir to combine. Place in a serving bowl and sprinkle with paprika. Eat! P.S. 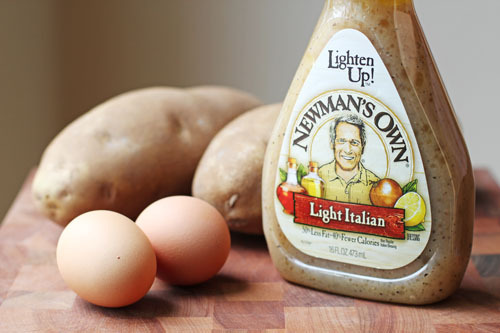 Part of my participation in this project with Martha’s Circle was my recipe featured in a Newman’s Own advertorial in Everyday Food (kind of like the last recipe I did with them, which appeared in Martha Stewart Living). Freddy will love your recipe Jane. He tells me to leave the skin but out of habit I peel them. Shall try it real soon! Woohoo for being published! I’ll try your tricks soon. I always use Italian dressing and was told to dump it on the potatoes while they’re hot. Supposedly that really helps the taters soak up the dressing. 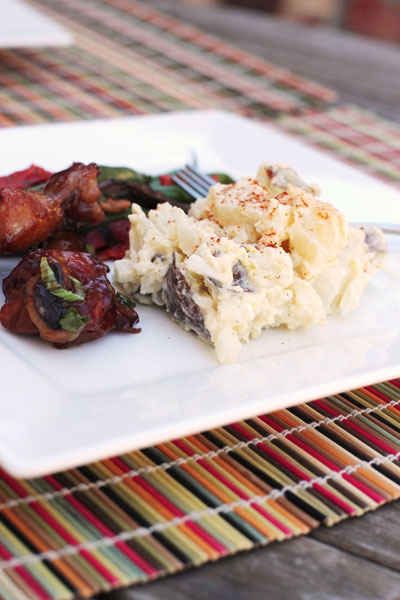 I definitely have to try this version of “Gram’s” potatoe salad. I am always looking for tasty ways to reduce the fat without losing the taste. Thanks Jane! Can’t wait to see you later this summer! Congrats! How fun. What a great way to eat healrhier. Congrats on being published! That’s so fun! I have never heard the tip about the dressing on the potatoes. I’m going to have to try it. My mom may freak out ~ it’s her “family recipe” I usually use, but these healthy changes sound fantastic! We’ve got potatoes coming out of the garden as we speak, so now’s a perfect time!! Wow! I have been wanting to make potato salad lately and now I am so inspired. I love the idea of adding the cauliflower. genius! i put bok choy in mine last weekend and no one noticed 🙂 teehee! Congratulations! Your first Own It write up in Martha Stewart was how I found your blog. I’m excited for all the new people who will now find it. 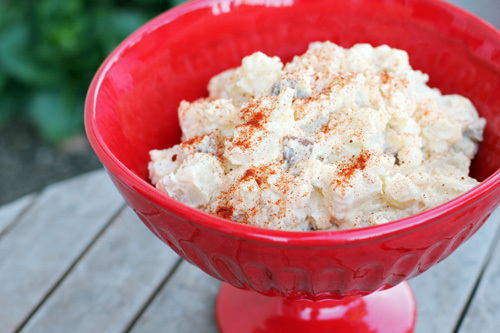 I made the Cook’s Illustrated All American Potato Salad last week and I liked it. But I’m going to use your recipe next time because of the three healthy twists. SOOOOOOOO Proud of you! Holy guacamole! I just discovered the trick on substituting yogurt for mayo in tuna salad and was thrilled with the results. I have that issue of the magazine and didn’t even notice. I just keep trying plain yogurt in all kinds of stuff like that – I’ve been using it in chicken salad similar to your tuna salad! it really can work great a lot of the time! And it was just yesterday that I typed “healthy potato salad recipe” into Google. Love this one. Definitely trying it out for the Fourth!